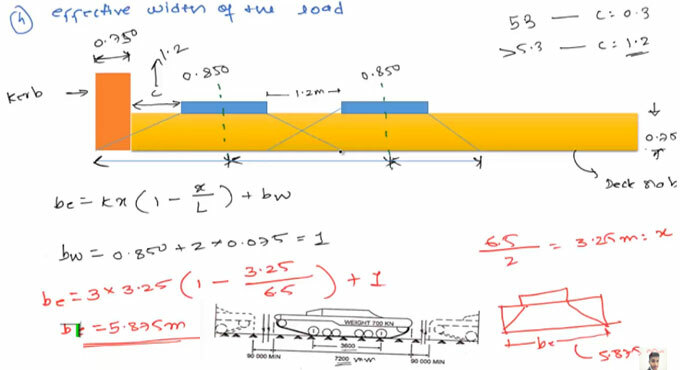 In this construction video tutorial, Mr. Parag Pal, the renowned engineer, has briefly explained how to define the maximum live bending moment for AA-Track load. This video will also help to gain knowledge on the bridge loading estimate where you will learn how to workout the Dispersion of load on both the side of the bridge deck. IRC standard live loads: In India, highway bridges are designed by adhering to IRC bridge code. IRC: 6 - 1966 – Section II provides the specifications for the different loads and stresses which should be taken into consideration for bridge design. IRC class AA loading contains either a tracked vehicle of 70 tonnes or a wheeled vehicle of 40 tonnes with dimensions. The measuring units are mm for length and tonnes for load. Generally, bridges with Steel Structures and state highways are designed with these loadings. Bridges designed for class AA should be examined for IRC class A loading also, because under specific conditions, greater stresses are attained under class A loading. Sometimes class 70 R loading is provided in the Appendix - I of IRC: 6 - 1966 - Section II can be applied for IRC class AA loading. IRC class AA loading is segregated into track load and wheel load. Class A loading comprises of a wheel load train inclusive of a driving vehicle and two trailers of specified axle spacings. This loading is generally selected on all roads on which permanent bridges are built up. Class B loading is chosen for temporary structures and for bridges in specific areas. For class A and class B loadings, reader is referred to IRC: 6 - 1966 – Section II. To learn the detail calculation process, watch the following video tutorial.